The Master of Science in Higher Education Counseling / Student Affairs (HECSA) program is designed to prepare students for careers working as counselors and student affairs professionals in a variety of higher education and non-profit settings. The program meets the American College Personnel Association (ACPA, 2003) Professional Preparation Commission standards and the Council for the Advancement of Standards in Higher Education (CAS, 2012). Our program is listed in the ACPA Directory of Graduate Programs and the NASPA Graduate Program Directory. Completion of the degree also meets the educational requirements for those seeking positions as counselors in the California community college system. Candidates for the program come from a wide variety of educational and professional backgrounds; no specific undergraduate degree is required. Though many candidates enter the program with backgrounds in Psychology and Social Sciences, others have possessed backgrounds in Agriculture, Business, Mathematics and Sciences. Students attending full-time complete the 72-unit program in two years; students attending the program part-time typically complete the program in three years. A major strength of the program is its extensive internship program, which takes place during the second year of studies and provides students with “real world” work experience. Many of our graduates are employed across the Cal Poly campus and at local community colleges. 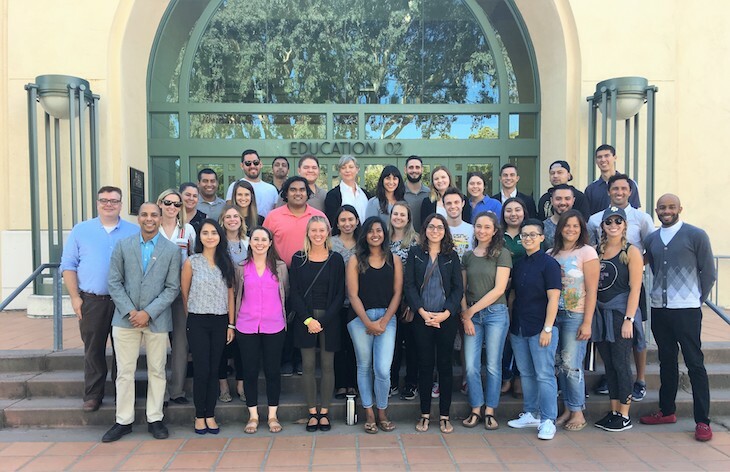 The program enjoys a large and supportive network of alums employed in higher education and non-profit settings throughout California and the Western Region of the United States. The mission of the HECSA graduate program is to prepare caring and culturally competent higher education counselors and student affairs professionals emphasizing student success for ALL. We embrace a polytechnic, “learn by doing” approach throughout the program.